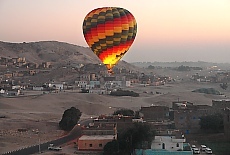 The Hot Air Balloonstart at sunrise over the desert takes place at the westbanks of river Nile. A small boat takes us from our hotelship in Luxor towards Theben West, the necropolis of the death. 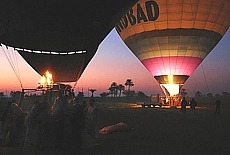 In total 7 Balloons were made ready for takeoff, 3 of them are owned by Sindbad Balloons. The burst of flames and snorting of the gas burner in the dawn creates a ghostlike atmosphere. 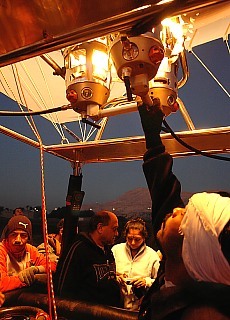 During takeoff the ground crew sings, drums and dance in the glistening light of the gasburner. 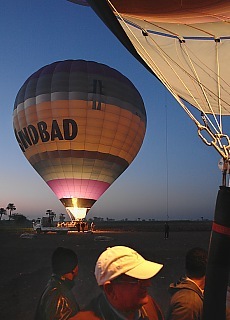 As our balloon raises, they shout "Allahu Akbar - Allah is great". 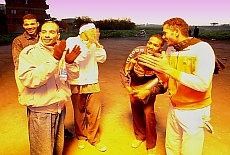 The new day announces pink-coloured on the wide horizon of the desert. 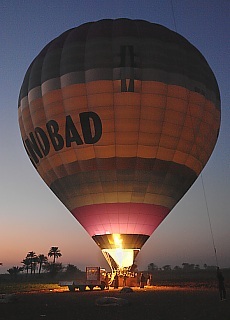 The balloon envelopes of the silent in desertwind through the fertile Nile valley of Upper Egypt floating balloons glow in the twilight like colorful lanterns, when the Pilot ignites a burst out of one of the two gasburners. Our first target is the terrace temple of Hatshepsut. But before getting closer to Hatshepsut's temple, the wind drifts us towards Ramsesseum and Medinet Habu. In the deep below us passing villages the Egypt people are still dorming on the roofs of there houses direct under the beautiful starry sky. 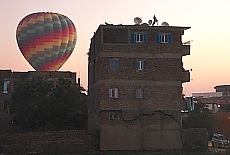 Slowly the sun rises geht die Sonne above river Nile and life wakes up. The red Balloon of Magic Horizon drops down and throws his shadow onto the V-shaped Portal of Medinet Habu Pylons. Faraway the Collossi of Memnon appear on the horizon. Now our Pilot drives within touching distance to the giant stone monuments. Infront of the Collossi of Memnon at the bus park is crawling with tourist busses. 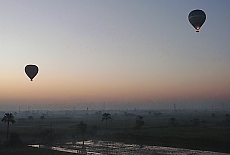 We proceed our loudless balloon trip at low elevation close to the tree tops of palm trees. We nearly can harvest the mellow date fruits. 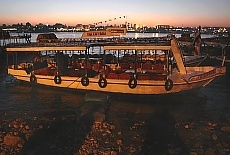 A river Nile cruise from Luxor to Assuan, with excursion to Abu Simbel.